To visit Italy through the not so usual navigating system but using the many waterways running through this wonderful country, you can choose river routes and navigation in lakes and lagoons. They represent one of the best opportunities to appreciate the area, between the plain and the sea, from Piemonte to Friuli Venezia Giulia and subsequently to Tuscany. Through the traditional waterways you can rediscover the ancient relationship between man and water, integrating the traditional use of waterway navigation with other types of tourist use, such as holidays riding bikes including valuable natural parks and historic architectural treasures. Cruises Boat, trips in houseboat and explorations with small boats, rafts and canoes are the different ways to “live” in an unusual way and more closely, the locations of the various regions, unique landscapes, historical and cultural references and typical food of the place. Talking about route and path, we refer respectively to the river network and ground path by bike or on foot. The itineraries are planned with navigation predominantly in favor of current. The routes are suggested to be understood in order to know and visit the main sights. The moorings, to be considered in the light of available hydrometric conditions of the river and / or the channel, are used for loading and unloading but not as moorings. The length of the river routes is estimated at a maximum speed of 7-8 km / hour, the right one for a river cruise. There duration of trails by bike and on foot is estimated respectively with an average speed of 10-12 km / hour and 3-4 km / hour. All itineraries can be practiced by small boats, dinghies, canoes and kayaks, paying due attention to the hydrometric conditions, navigability, psycho-physical preparation and, not least, to the river signalization. It is advisable to navigate in the middle of the water and in the corners stay outside because there is a greater depth. In any case, follow signs waterway or river, such as that of the river Po, which regulates a precise navigation, indicated by signals shore, of riverbed and opening pontoon bridges. Among the signs also remind those relating to the recommended steps and berthing fees, anchoring, mooring and their prohibitions. Navigate in the vast expanses of Venice lagoon with small boats, rafts, canoes or house boat, is an unforgettable experience and the most authentic way to visit this city of water unique. However, must pay attention to signs for everybody safety. The fairways in the lagoon, along waterways with greater depth, are promptly indicated by “briccole” signals consisting of three wooden poles of rimmed iron, on which a number is shown . It is easily to locate them, and sometimes to understand even the maximum speed allowed in the waterways. In addition to the ‘ briccole’ , intersections have a red plate to the left and a green to the right, to indicate the beginning of a new waterway, there is the ‘meda’, formed by a single pole, and the” dama”, which has the shape of a dolphin biggest with a pole highest at the center. A river cruise in Italy by boat without a license is perfect to combine with cultural interests the pleasure of sailing among the most beautiful nature. The beautiful Venice emerges in the middle of the lagoon, a visit to San Marco and the countless churches and works of art, a walk through the typical streets of Venice, than take a gondola ride on the Grand Canal. The islands of the Venetian Lagoon are an unique jewelry in the world and a UNESCO World Heritage: moored in Burano, and will be stunned by its colorful houses. 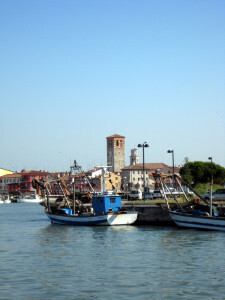 Visit than the Murano glassmakers. The Riviera del Brenta offers numerous public moorings in front of his majestic Palladian villas. There are villas and pretty village squares from Venice to Padua: Scrovegni Chapel by Giotto is just one of the many artistic treasures of the city. If you prefer natural environments pristine lagoon and rivers of Friuli Venezia Giulia are perfect: you will find typical huts in the middle of the reeds, restaurants allocated in small lagoon islands, accessible only by boat and delightful towns seafarers as Grado and Marano. Here you will also find the ancient Aquileia and its ruins, UNESCO World Heritage. Venetian coastline from Venice to Trieste (main axis and branches) In our section MEMBERS there is a list of points about rental houseboats, and operators who organize navigation routes and excursions with tourist Boat and ferry. 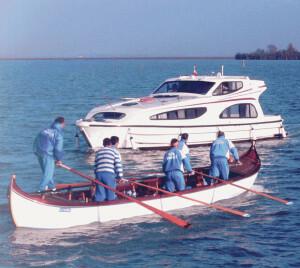 The boats and motorships perform daily excursions in inland waterways, are characterized by the excellent panoramic views, capacity, services on board, for the highly prepared guides, for the quality of food in restaurants on board, where kitchens of fish and meat , linked to the most ancient traditions, will be able to satisfy the most demanding palates.